Marcos Kwasniewski: 🙌 "Kraft now, Pay Later"
Kraft now, pay later. 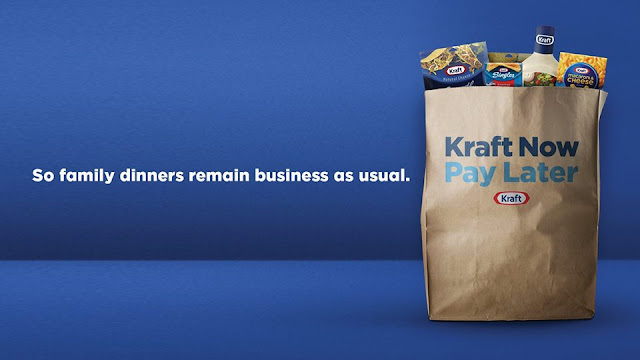 Workers with any valid government ID can take home a bag of groceries filled with Kraft products. Be nice and do kind stuff, not for the recognition but because it is the right thing to do. https://www.madaku.com/ 2019-01-24T07:32:00-08:00 2019-01-24T15:32:46Z Marcos K. Kraft now, pay later. Workers with any valid government ID can take home a bag of groceries filled with Kraft products. Be nice and do kind stuff, not for the recognition but because it is the right thing to do. 🙌 "Kraft now, Pay Later"
In case you were living underwater, or only watching Fox News, the longest Government shutdown in history has been going on and most workers are not getting paid. Many major brands and several mom-n-pop stores jumped in and decided to help them. Last Tuesday, Kraft announced that they will open a temporary store (Jan 26-20) at the nation's capital. Kraft will provide free food to government workers. If just an egg raised millions of likes, then this should at least be shared enough to repay Kraft for their kindness. Kraft only asked the workers to "pay later" by donating some money to whatever charity they like when they start getting paid again. ...and this is you, having that epiphany moment. Why are you writing about this? Your niche is about marketing and design people. This is about a company helping communities...wait, maybe this involves branding somehow, maybe Kraft got great exposure by being super nice to people (not saying they did it for the fame). Maybe an act of kindness goes a long way and is worthy of sharing, even if you are miles away from it because you care. Marcos, as always, has a great point there. Indeed, triggered emotions are likely to be shared and in most cases even promoted. Unfortunately so does bad emotions, like that douche kid and the Native American. be nice and do kind stuff, not for the recognition but because it is the right thing to do. Escrito por Marcos K. en la fecha de January 24, 2019.